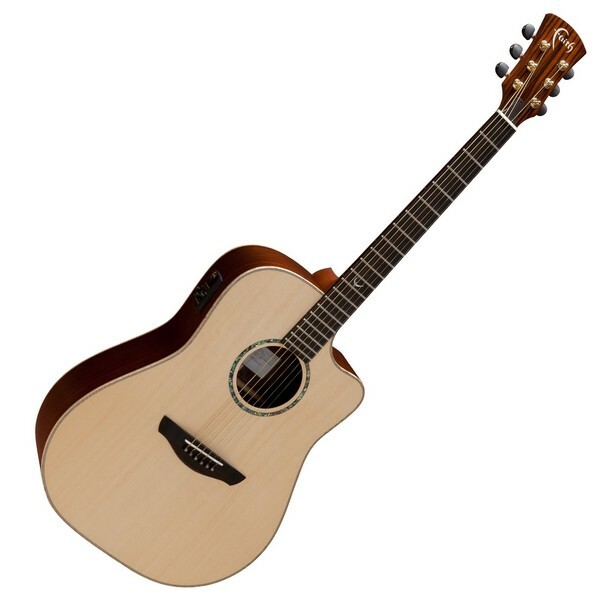 The Faith Saturn Dreadnought Cutaway Electro Acoustic, Hi Gloss is ideal for the gigging guitarist or performing singer/songwriter craving an all-solid-wood guitar that has been designed and finished with standards expected on higher-end instruments. This affordable solid wood construction features an engelmann spruce top and rosewood back and sides that not only offer a pleasing visual appeal, but produce a classic sonic performance with plenty of versatility, power, deep lows, articulation, bright, zingy tones, and clarity. Additionally, the tone produced combined with its dreadnought cutaway body make the Faith Saturn particularly ideal for lead/solo work and a variety of picking techniques including fast runs and articulated lines. Furthermore, the Saturn body offers added comfort to each performance via its Venetian cutaway profile, enhancing playability by providing easy access to upper frets and more challenging chords. Lastly, the Faith Saturn also comes equipped with a Shadow Performer preamp, perfect for live and studio work. The Faith Saturn Dreadnought Cutaway features an entire solid wood construction for a superior tone and an incredible dynamic response. Its solid engelmann spruce top yields crisp articulation and slightly richer mid-range than sitka spruce. The solid top's smooth tone provides a versatile soundboard that is able to accommodate numerous genres and techniques with equal ease, from various picking styles to heavier strumming patterns. Furthermore, the solid engelmann spruce top is paired with solid rosewood back and sides that produce a powerful, warm, deep bass response. Its solid rosewood back and sides also produce an incredibly rich tonality with a throaty growl while its treble notes sparkle with plenty of crystal clear clarity. Lastly, with rosewood's iconic tone and spruce's versatile nature the Faith Saturn is ideal for bluegrass, folk, country licks, as well as accommodating meaty chords and a variety of picking techniques. With Faith's original dreadnought body, also known also as the Saturn, the player receives an all-solid wood instrument with superb volume, projection, and maintained balance across the sonic-spectrum. 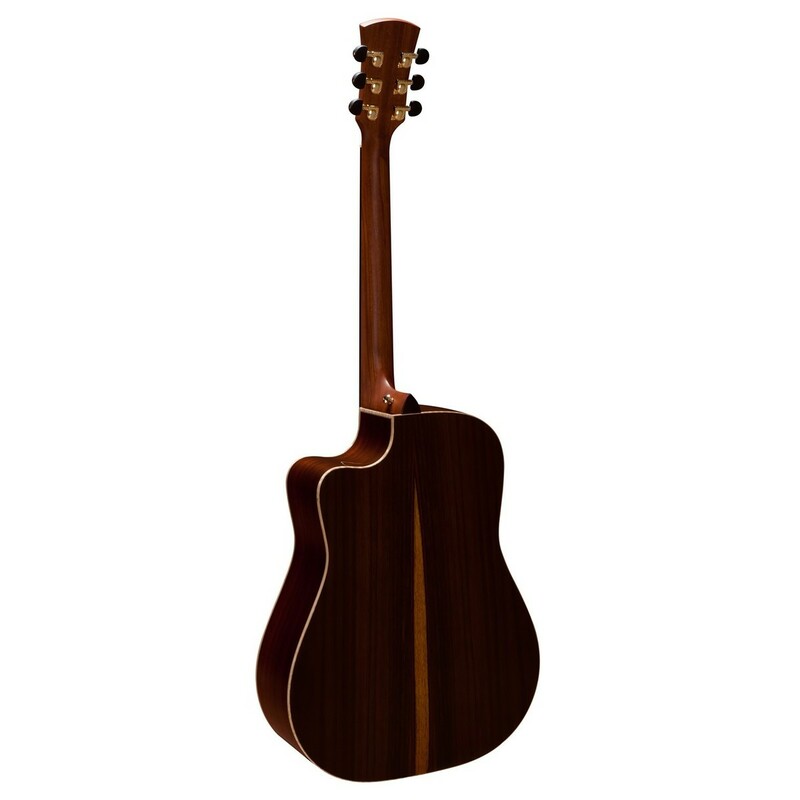 This all-rounder of an acoustic guitar is able to accommodate genres including rock, pop, country, blues, bluegrass, folk and much more, as well as being equally suited to multiple fingerpicking and strumming techniques. Its bigger body also has more room for sound to reverberate and combined with Patrick James Eggle's bracing, the Saturn provides the player with a rich, full-bodied acoustic voice that also acts as an ideal vocal accompaniment. Furthermore, the Faith Saturn offers a comfortable playing experience for those more comfortable with bigger bodied guitars. Lastly, for added comfort, the Faith Saturn also features a venetian cutaway profile, providing easy access to upper frets and more challenging chords. With a neck constructed from mahogany, the Saturn offers a quick and dynamic response with plenty of warmth and resonance. Mahogany's nature allows it to respond superbly to numerous playing styles and techniques with ease, perfect for getting creative and unleashing true potential. Furthermore, the neck is topped with an Macassan figured ebony fingerboard that adds ringing sustain, plenty of bite and a bright sizzle to the guitar's overall tone. For added aesthetic appeal, the fingerboard also features Faith's majestic 'F' logo placed on the 12th fret and inlaid in mother of pearl for an elegant look. Equipped with quality Shadow electronics, the Faith Saturn becomes ideal for live, studio and rehearsal environments, perfect for the gigging guitarist and performing singer/songwriter. In addition, the Saturn Dreadnought Cutaway is fitted with a Shadow Nanoflex pickup that will project each string played purely and clearly, enabling the player to hear each stunning nuance this solid wood construction produces. Furthermore, the Saturn also features a side mounted Shadow Performer preamp with built-in EQ that includes volume, bass, and treble, allowing the player to tweak their amplified sound to personal preference. Lastly, the preamp comes with a built-in tuner which can be used whether playing acoustically or amplified, perfect for quick and precise tuning on-the-go.